An early reminder that the PRINCESS MAY MARKETS at Clancy’s will be on this Friday from 5-9 pm with cool live music by Jim Fisher, international food stalls, Damian’s animal touch farm, graffiti art lessens with Lady Bananas and fun for the kids with Fairy Sandie. There is a lovely ambience at the PMM so come along and bring some friends. Parking is not a problem in the area. DIAMOND DAVE AND THE DOODADDIES will feature this evening on the Clancy’s/Little Creatures stage at the homely PRINCESS MAY MARKETS in the historic park next to Fremantle’s famous fish pub. We are open from 5-9 with great international food stalls and a lot of things to do for the kids. Farmer Damian is bringing the animal touch farm, Fairy Sandie will blow bubbles and entertain the children, there is face painting and the lovely Lady Bananas will teach how to make great graffiti art. The butter chicken at the Goan Indian stall is yum and so is the mixed Dahl. I had a stunning falafel wrap from Give Peas a Chance last week that is well worth a try, even for carnivores like me. There are papusa, empanadas, pizza, icecream and coffee from Miss Tartufo-try the afogato; espresso on vanilla ice! We have a new Spanish paella stall starting and there is a whole lot more. SEE YOU AT THE MARKETS PRINCESS! It’s a bit of a misleading headline because it should read SEE YOU AT THE PRINCESS MAY MARKETS TONIGHT! Yes, we are open from 5-9 pm in the cosy park next to Clancy’s with international food stalls and market stalls. Local music legend DOM MARIANI and the Majestic Kelp will entertain us from the Little Creatures stage, so that alone should be a reason for the Freo community to flock to the Princess May Markets. We have food on offer from Bush Tukka Fusion, Peruvian empanadas, Salvadorian papusas, Italian pizza, Goan Indian curries, falafels from Give Peas a Change, French crepes, Spanish paella, Chai, icecream and coffee from Miss Tartufo, etc. The beautiful Lady Bananas has recovered and will be back with graffiti art classes for children, Farmer Damian will set up the animal touch farm and Fairy Sandie will spin her magic and bubbles. The PMM is a great event for young and old so bring some friends, have a dance, pop into Clancy’s for a nice glass of wine or beer and enjoy the very Freo ambience! See you at the markets, princess! Comments Off on SEE YOU AT THE MARKETS PRINCESS! It was very hard to compete against the Giant Puppets last weekend with thousands of Fremantle people flocking to Perth for the spectacle. So we had a far too quiet PRINCESS MAY MARKETS last Friday and we need the Fremantle community to support the new venture and the many local small businesses who are at the cosy park next to Clancy’s every Friday from 5-9 pm. We had great entertainment on the stage by the Wal’tons, Farmer Damian had set up the animal touch farm for the kids and there was delicious international food on offer and a variety of market stalls from plants to books, clothing, preserves, etc. There is plenty of parking in the area so no worries there. RELAX AT THE PRINCESS MAY MARKETS TONIGHT! The homely setting of Freo’s ‘village green’ is perfect for the very relaxing and family-focused PRINCESS MAY MARKETS that is on again in the park next to Clancy’s from 5-9 today. Entertainment will be provided by the WAL’TONS and their big moustaches. We have a nice variety of market stalls to browse through and buy some goodies from and of course the international food stalls will provide for dinner away from home. The Peruvian empanadas and panacotta are in high demand, as is the Goan Indian and the yummy curries they serve with a smile, Miss Tartufo and La Paleta will look after those who like it cold and sweet, and there will be Salvadorian, Italian, Spanish and other food from around the world. For the first time the very Freo sounding Give Peas A Chance falafel food stall will take part in the PMM, so look out for them. The lovely Lady Bananas will do graffiti art demonstrations with the children and Farmer Damian will set up the very popular animal touch farm, and Fairy Sandie will be there with bubbles and smiles and hoolahoops, facepainting and henna. It’s only the 5th Princess May Markets so the community needs to step behind us and make it a Friday night tradition. Small businesses are the spice of the economy, so come and support us, have fun, relax. SEE YOU AT THE PMM TONIGHT!! Comments Off on RELAX AT THE PRINCESS MAY MARKETS TONIGHT! Here some photos of the utterly relaxing Fremantle PRINCESS MAY MARKETS, with which I am involved. It is on every Friday from 5-9 om in the cosy park next to Clancys. It is a really family market with lots to do for children, outstanding live music on the Little Creatures stage, fantastic international food stalls and a great variety of market stalls to browse through. And of course there is a huge selection of craft beers and good wines to sample at Clancy’s for the grown ups while the kids have a play with Fairy Sandie, or visit the animal touch farm or take graffiti art lessons from Lady Bananas. Markets support small businesses and are all about community and the Princess May is very Freo! 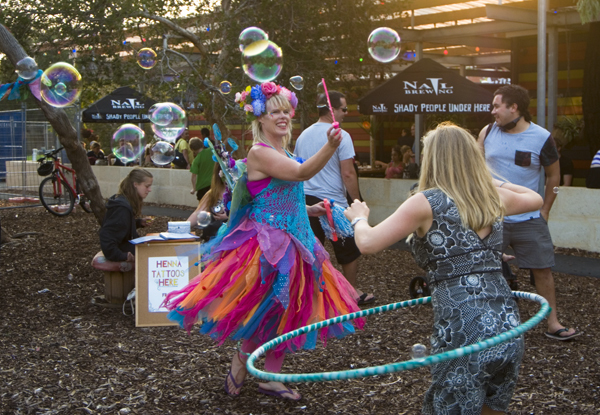 Did you miss out on the Fremantle PRINCESS MAY MARKETS fun last night? The good news is that we will be going till the end of April and that the word is spreading how cosy and family friendly the market is. Come and give it a try next Friday. We are open from 5-9 pm. The delightful Fremantle PRINCESS MAY MARKETS is on again today from 5 to 9 pm on the historic ‘village green’ next to Clancy’s Fishpub. Local musician Carus will be on the Little Creatures stage and entertain the crowd, and the animal touch farm, graffiti artist Laday Bananas and Fairy Sandie will keep the children occupied. Frenchman George, who used to have a cafe in the High Street Mall, is back from France and will set up stall and make delicious Crepes. Also new to the PMM will be a Chai stall,and Silvia will be there for the first time with pies, the Bushtucker van will sell yummy sliders with pulled pork and other fillings, while Kulsum and Ahmed will offer their great Goan Indian curries. Dom makes great pizza, Iliana papusas, and Mirco’s Paella is a treat. La Paleta and Miss Tartufo will look after the sweet tooth. And of course we got a variety of market stalls selling things from books to clothing, vintage plants, preserves, bricabrac. Markets are only successful when supported by the community, so spread the word within your network that the Princess May Markets is a great way to relax and start the weekend. See you all there tonight! It is interesting to note that Frenchman George has stated he cannot afford the high Freo rents and hence he is starting at the PM Markets. Disappointing to see though that BID has declined to support the markets and that the City of Fremantle declined to put an electronic sign opposite the train station to make arriving people aware of the new markets in the East of the CBD that is desperate for revitalisation. One keeps wondering about the inconsistency of it all. There is plenty of parking along Beach, Parry, Ellen, Queen Adelaide, Cantonment and Point Street and in the Point Street carpark. The weather bureau predicts a mild day for Friday so what better way to spend the evening with great live music, international food in the relaxed community ambience of the Fremantle PRINCESS MAY MARKETS. It will be the fourth one and families love it because the park next to Clancy’s is very safe for children as it is surrounded by walls. There was high praise for the pannacotta and other sweets from the Peruvian food stall who sold all their yummy empanadas, and the bush tucker sliders were very good value as well I was told. The Goan Indian is a favourite with many and so is the large book stall. There is icecream and La Paleta, coconut drinks, pizza, Salvadorian cuisine and something for everyone. The animal touch farm, Fairy Sandie, facepainting and the graffiti art classes by Lady Bananas are a favourite with the kids. We open from 5-9 and there is heaps of parking around. Street parking in the area is free after 5 pm. Come along and say hello and have fun!